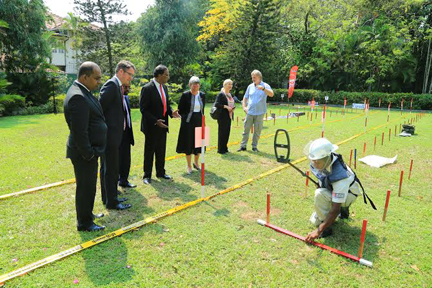 The High Commission of Canada to Sri Lanka and the Maldives marked 'International Day for Mine Awareness and Assistance in Mine Action' on April 4, with an event at Canada House bringing together key government officials, members of the international, diplomatic and donor communities, demining organisations and civil society. Minister for Prison Reform, Rehabilitation, Resettlement and Hindu Religious Affairs D.M. Swaminathan was the Chief Guest. The High Commissioner of Canada, Shelley Whiting reccomended the considerable gains made in mine action and mine clearance in Sri Lanka since the end of the conflict in 2009 and stressed the importance of continued, collective efforts for mine-impact free Sri Lanka by 2020. High Commissioner Whiting said "Canada welcomed Sri Lanka's announcement of progress with respect to accession to the Ottawa Convention and looks forward to continued engagement with Sri Lanka in the months and years to come, as we strive together to create a world and a Sri Lanka free of anti-personnel mines."